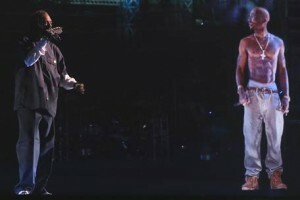 Tupac preforms at Coachella Festival 2012? Despite supposedly having been dead for over 15 years, Tupac Shakur joined Dr. Dre and Snoop Dogg on the main stage at Coachella late Sunday night. Coachella Music Festival Tickets are still on sale for April 20th, 21st and 22nd. An all-too-realistic hologram of the late rapper rolled through “2 Of Amerikaz Most Wanted” and other hits in the California desert. Even more unnervingly, he started his mini-set by shouting out “Coachella” by name.